Rough opening measures 22 1/2" x 22 1/2". Rough opening measures 22 1/2" x 34 1/2". Rough opening measures 22 1/2" x 46 1/2". Rough opening measures 30 1/2" x 30 1/2". Rough opening measures 30 1/2" x 46 1/2". Maximum skylight clearance 34 1/2" x 50 1/2"
Rough opening measures 34 1/2" x 34 1/2". Maximum skylight clearance 38 1/2" x 38 1/2"
The Solar Powered "Fresh Air" curb mount Skylight features a solar panel that captures any available daylight and uses it to recharge a highly efficient, fully concealed, battery powered operator and control system. The battery powered operator is the power source that opens and closes the skylight and the solar panel serves as the charging source of the system. 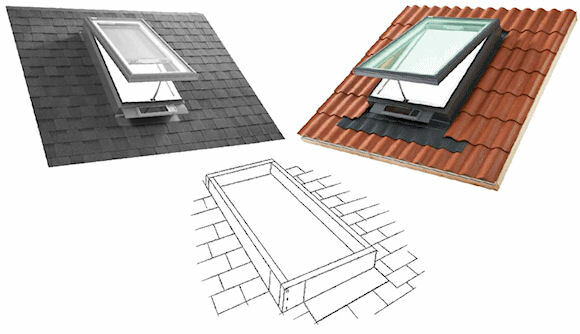 Price includes remote control for operation of the skylight. Solar powered blinds are optional and can be factory installed if ordered with the skylight. Eligible for a 30% federal tax credit including the cost of installation!